Isuzu D-Max is a tough robust outstanding compact pickup truck built for the extreme sense of urban class adventure outdoor journey drive. It provides a true meaning of fun and pleasure for all ages of customers especially for a young breed who keeps a flair and passion to do some distinctive sort of challenging risky drive. 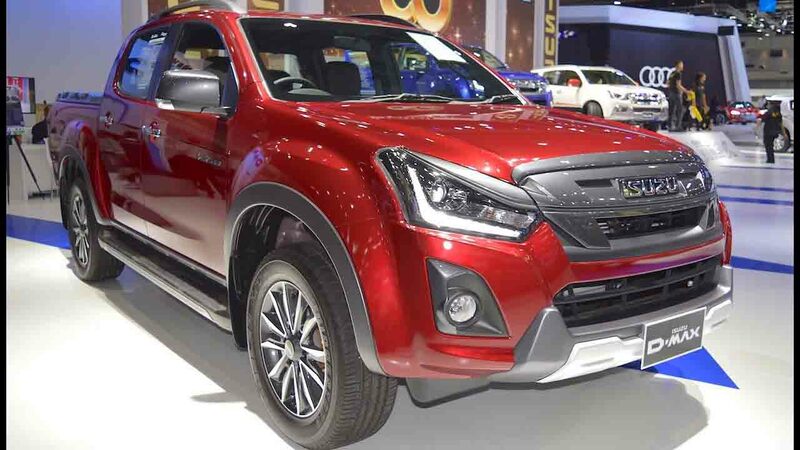 All-New Isuzu D-Max V Cross 2018 is a stunningly redesigned midsized light-duty 4×4 pickup truck which crosses all limits and boundaries with a dynamic 4×4 off-road all-terrain capabilities for customers. It is a trendy stylish Thai made pickup marking its absolute presence in the global market by showing a rising demand and valuable appeal for customers. It provides an exhilarating driving experience for all young age people seeking ways for a weekend vacation trip and always gets ready to set out for an exciting recreational all-terrain journey. The powerful and durable wishbone suspension at the front with rear spring and gas shock absorber for keeping a stable on-road grip and uniform smooth acceleration for a seamless actionable aggressive drive. This sporty pickup features a sleek design appearance manufactured with a rugged solid exterior body structure ideal for all kinds of jumpy and jerky harsh road surfaces. It is combined with glittering shine accessories of bigger front LED headlights, under spoiler front fog lights, front chrome metallic emblem grille, lower grille, front bumper, black roof rails, power side mirror with LED turn signal indicator light, and alloy wheels. From the backside, it shows a bold confident display appeal to customers by adding with shark fin rear radio antenna, high mount stop light, vertically fitted LED taillights and black coloured rear step bumper. The 4 newly added exterior colours enhance increased scenic attraction with an eye-catching noticeable appeal for everyone such as arctic silver, cool black, pearl white and red mica. Interior Design features a high tensile steel dual cabin pickup with spacious five seating accommodation and the premium class leather fabric seat covers add more comfort for a relaxing journey experience. The internal dashboard cockpit panel provides a terrific display style well equipped with advanced key essential features including as air-condition, power steering, power windows, anti-lock braking system, central locking, electronic brake force distribution, electronic stability control, brake assist, passive entry and start system, 8 speakers surround sound audio system and blue tooth connectivity, instrument panel with multi-information display, assist handle grip, pretension seatbelts, as well as dual front, side, and curtain airbags for extreme safety. It is a right-hand 4×4 4-door pickup truck fitted with 3.0 litres of a turbocharged diesel engine and powered by automatic speed gear transmission comes with a special model lineup of the crew cabin, extended cabin, and regular cabin varieties. This brand new V Cross Pickup gives a striking look with an aggressive feel display to show for customers. The increased cabin deck is ideal for extensive payload storage capacity with an easily locked tailgate. It is a luxury urban pickup designed for both off the road and on the road fast-paced drive for keen enthusiasts.